Syracuse, NY. Frank and Millie Garrett House. 110 Highland St. Ward Wellington Ward, architect, 1913. Photo: Samuel Gruber 2019. Syracuse, NY. Frank and Millie Garrett House. 110 Highland St. Ward Wellington Ward, architect, 1913. This is the only piece of imitation thatch that still survives. Photo: Samuel Gruber 2019. Syracuse, NY. Frank and Millie Garrett House. 110 Highland St. Ward Wellington Ward, architect, 1913. Chimney. Photo: Samuel Gruber 2019. The Frank and Millie Garrett House at 110 Highland Street was designed and built by famed Arts & Crafts architect Ward Wellington Ward in 1913 on Syracuse's Northside. Along with many other Ward-designed properties, it was listed on the National Register of Historic Places in 1997. Unfortunately, National Register listing has not ensured it upkeep - and may be no guarantee of its survival. The privately-owned house appears abandoned, and continues to deteriorate. Already, the cost and effort to save and restore it will be considerable. The house faces west onto Highland Street not far from James Street and nearly opposite Rose Hill Cemetery. This was an affluent residential neighborhood in the late-19th and early 20th-century, but since the 1950s has been transformed with many modern commercial buildings, especially along the James Street corridor. The close juxtaposition of such modern office and commercial buildings has made it difficult to promote the house as a desirable residential investment. The house was most recently purchased in December 2010 for only $5,500 by a buyer who professed the intent of restoring the house. Instead, it has been neglected and nearly abandoned for many years. A visit this week showed the house open – and apparently occupied by a squatter and (according to a neighbor) large raccoons. I do not know whether taxes have been regularly paid, though based on the last sale price those taxes would be quite low. As president of the Arts & Crafts Society of Central New York, an organization which was founded to protect and promote the built legacy of Ward Wellington Ward, I will be appealing to the City of Syracuse and the Land Bank to seize the house so that serious preservation planning, repair and restoration can begin. I took these pictures today - March 26, 2019 - and one can see the bad state of the building, even with similar photos taken a year ago. The house was designed for Frank Garrett, president and treasurer of the Syracuse Lithography Co., and his wife (later widow) Minnie, who lived in the house until her death in 1938. The house has only had a few subsequent owners. Beginning in the 1950s the house was rented, and was probably divided into three apartments around that time. The house is a two-story English Cottage style masonry house with stucco siding and half-timbering. Brown brick is used on the ground floor and in the entrance vestibule. The house is front-gabled, with smaller gabled bays projecting from the front and side facades. 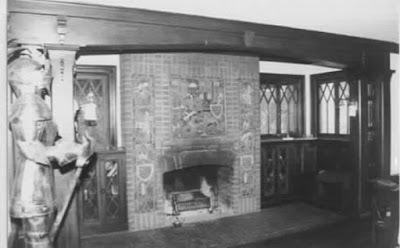 The most distinctive features were the imitation thatched roof made of thick asphalt tiles - now replaced except over the side entrance - and the Mercer tile mosaic fireplace. Both features are unique among Ward designs. The ground floor living room features perhaps the most impressive Mercer tile fireplace ever installed in a Ward house. As described in the National Register nomination and visible in pictures, it has a huge tile mosaic depicting St. George and the dragon set into the decorative brick facing of the chimney. According to Ward-scholar Cleota Reed, it is the only known such tile mosaic in a Ward house. "The fireplace and central mosaic are flanked by columns of smaller tile mosaics depicting related themes. 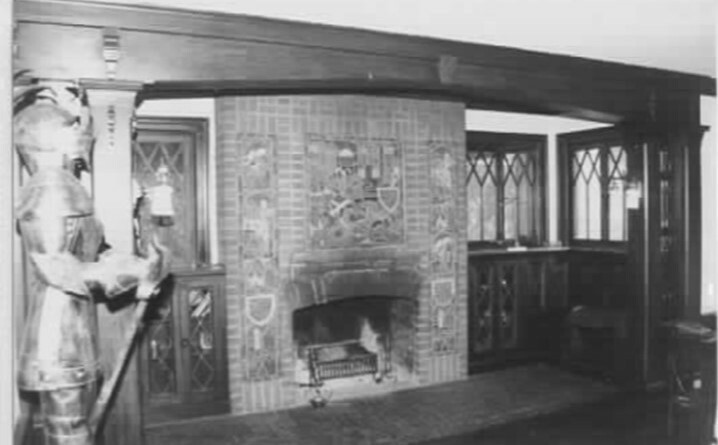 The fireplace is set in a large inglenook and framed by leaded glass bookcases. and the inglenook contains a window seat along the west wall. Pilasters and exposed ceiling beams decorate the main rooms of the first story. The former dining room features built0in bookcases with leaded glass doors." (from NR nomination). Syracuse, NY. Frank and Millie Garrett House. 110 Highland St. Ward Wellington Ward, architect, 1913.Fireplace as it appeared in the 1990s. Other distinctive features include leaded glass windows; built in bookcase in the living room; other original built-ins in the pantry; kitchen and second-story bath room; and many original finishes. The main stairwell is remarkable for its trio of exterior leaded glass windows capped by transoms. All six windows feature lights in a complex geometric pattern. The staircase is distinguished by a decorative banister and newel post. a smaller staircase to the east of the main staircase, originally used by servants, leads from the driveway up to the attic by way of the second story apartment on the east side. When the building was listed on the National Register in 1996 it was stated that "one of the most ambitious and unusual Ward designs, this house retains nearly all the features that contribute to its significance." Today, we are not sure what the state of the building is om the inside - but clearly the exterior features are deteriorating rapidly, and some have already been damaged beyond repair or entirely removed. Also contributing the building’s significance at the time of National Register designation was its masonry garage, probably built between 1924 and 1938, which had original doors and traces of a turntable, but now has since been demolished. Syracuse, NY. Frank and Millie Garrett House. 110 Highland St. Ward Wellington Ward, architect, 1913. Gable facing Highland. Photo: Samuel Gruber 2019. Syracuse, NY. Frank and Millie Garrett House. 110 Highland St. Ward Wellington Ward, architect, 1913. Porch on south facade. Photo: Samuel Gruber 2019. Source: Carlson, Richard. "Garrett Residence," National Register of Historic Places Nomination (August 5, 1996). My grandparents lived in that house when they first moved to Syracuse. Was not chopped into apartments until the late 60s or early 70s. I would really like to see someone restore it . We toured the house when it was up for sale a few years back and my uncle and father showed me around the different rooms. My fathers room was on the third floor and there used to be a turntable in the garage. It needed some work back then and is a shame that has fallen into such disrepair. The property tax structure in NY state, especially in villages/town-sites is not encouraging to restore these homes. I restored a mansion in Amsterdam, in Montgomery County, and found out after the fact, that the taxes were outrageously high for the price I paid for it. No one could retire on Social Security in Upstate NY... You'd have to come in with $$$, and or have investors.